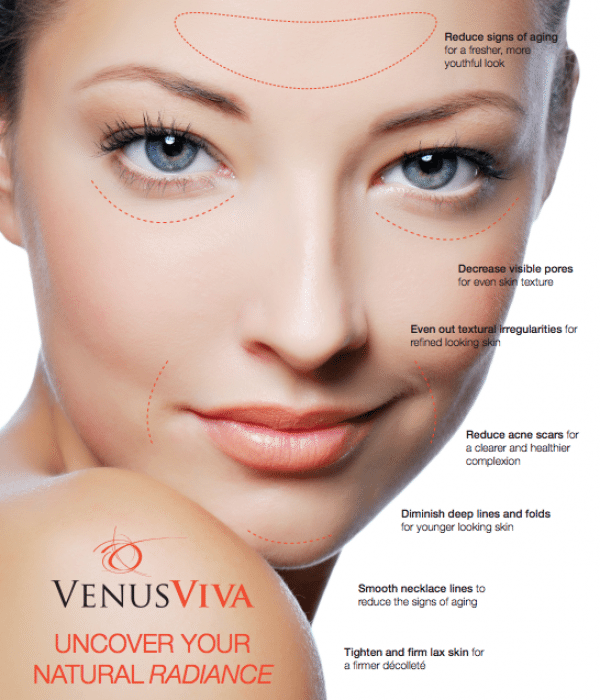 Venus Viva™ is a revolutionary, fully customizable FDA cleared solution for facial resurfacing. With the Venus Viva you can erase signs of aging to reveal tighter, brighter, and younger looking skin! The Venus Viva allows for customization and is approved for all skin types so you can address skin issues specific to you. The Venus Viva works on the deepest layers of the skin to encourage cell turnover and stimulate collagen production giving you firmer, tighter, more youthful skin. The Venus Viva also works on the epidermis to gently ablate the surface layers causing exfoliation that results in fresh, glowing, radiant skin. The Venus Viva is safe, non-invasive and suitable for all skin types. The Viva operates with revolutionary NanoFractional Radio Frequency(RF) and SmartScan technology producing superior results through a selectional dermal heating process. The use of NanoFractional RF delivers energy deep in to the dermis generating heat and initiating skin changes, remodeling collagen and causing the tissue to regenerate thus producing fresher younger looking skin. Treatments take less than 15 minutes, and patients can expect to see smoother, clearer and younger looking skin after one treatment but full results are seen after a series of three or more treatments are performed. Shortest downtime is less than 24 hours, though clients can return to their daily activites immediately following a Venus Viva treatment. Call today to learn how Venus Viva can restore your natural radiance!